The Quinphonic Festival is cited as being the world's first quintuple headliner. 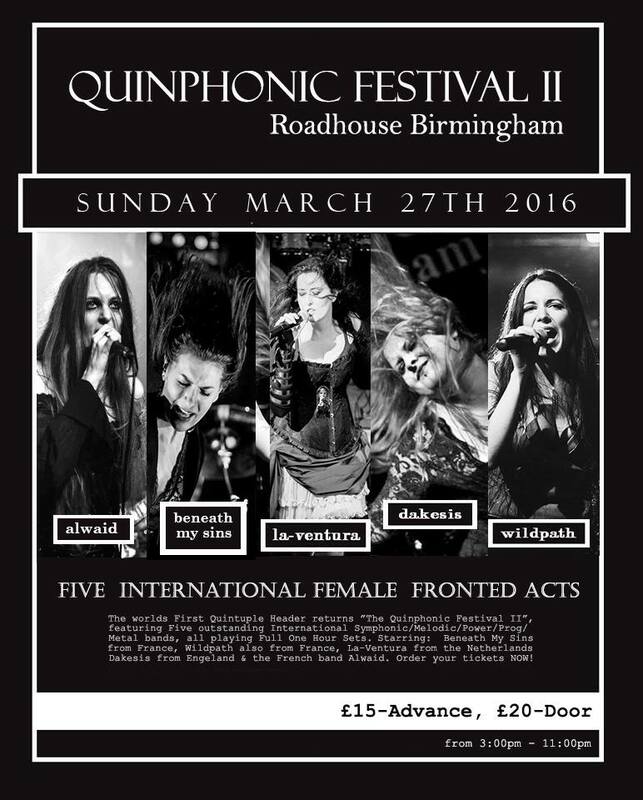 After a success in 2015, the festival is back for it's second edition, where it will host five symphonic and melodic metal bands from both the UK and Central Europe at The Roadhouse in Birmingham. Birmingham based progressive power metallers Dakesis will join a string of international names for The Quinphonic festival, the festival comes as one of many appearances the group will have this year. From France, the festival will bolster Alwaid, Wildpath and Beneath My Sins - with the latter two bands playing their debut UK show at the festival. They'll also be joined by Dutch melodic metal group La-Ventura, as part of their European mini-tour. Advance tickets are on sale for £15. The on-the-door price will be £20. The event is open to all ages 14+. Getting the chance to see some of the best up-and-coming, international, female fronted symphonic metal bands live in the UK is a rare treat – more so when you don't live in London. The Quinphonic festival presents us with a novelty experience and standing out amongst other festivals, if there's one up-and-coming festival you should go to this year, it's the Quinphonic festival.